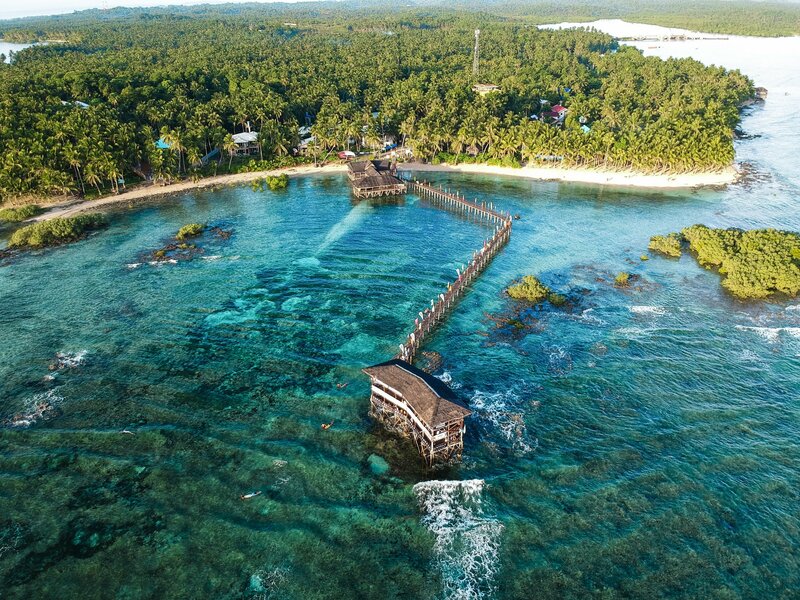 "If you're looking for the best sunrise or sunset spot on the island of Siargao, look no further than at Cloud 9." 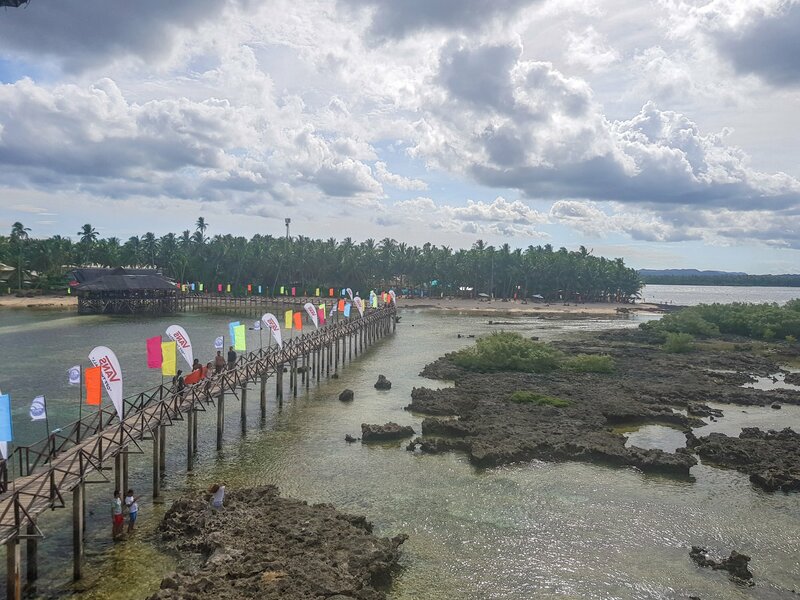 Before I even stepped foot on Siargao, I heard a lot about the famous "Cloud 9 Pier." 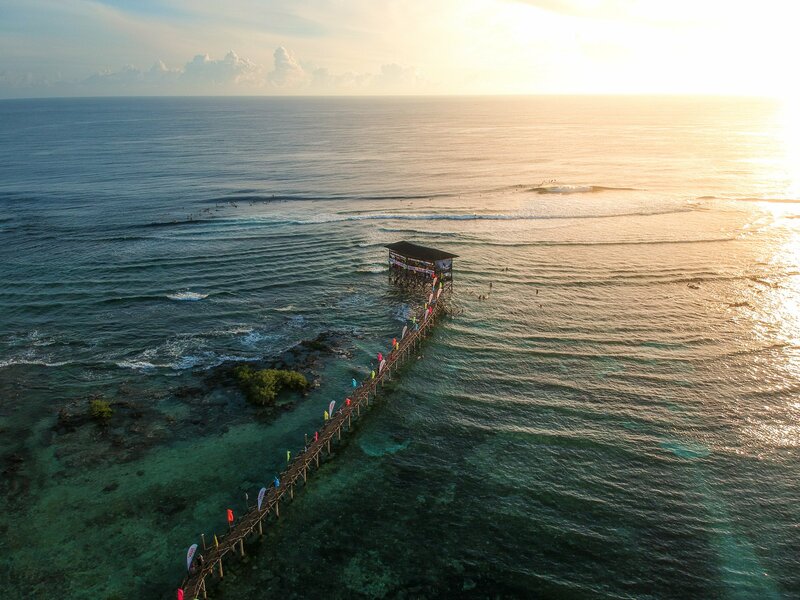 Situated about a 10 minute drive north of General Luna, this pier just out hundreds of metres into the ocean and is one of the best sunset spots on Siargao. 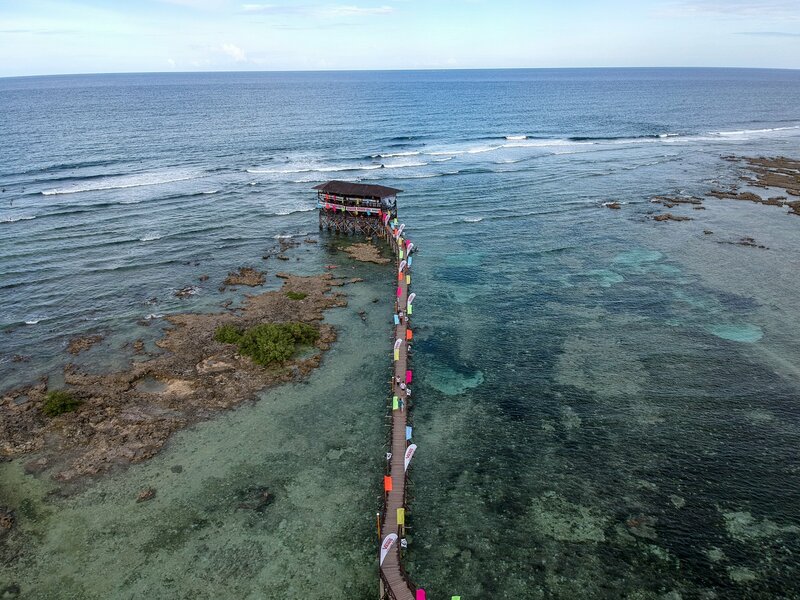 In addition to this, I also heard that the pier served as a fantastic drinking and chilling spot with companions, as well as the perfect place to watch surfers show off their skill from the top of the three-level deck that jutted away from the island. I also heard that for sunrise and sunset, this was the place to be. 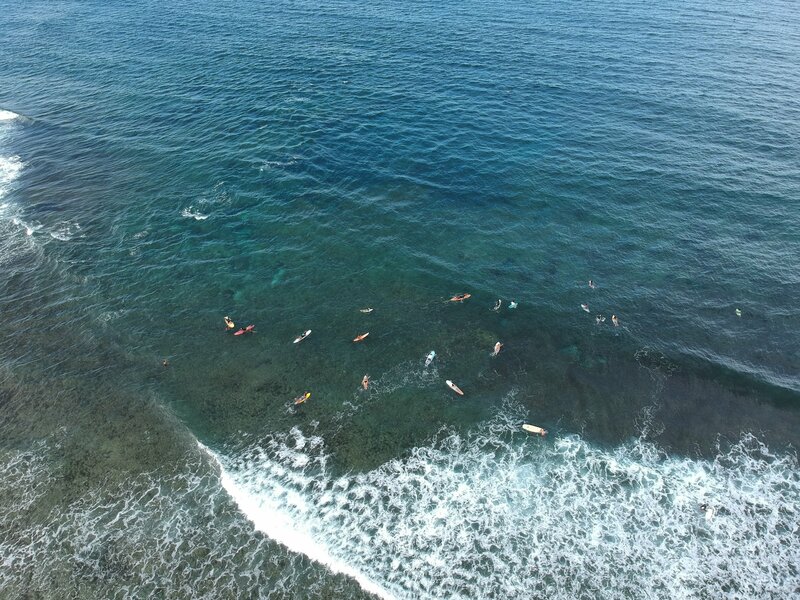 After conversing with the hostel staff, I found out there were many surfing spots around the island, and that many of the surfing lessons taught was in the nearby spot of Cloud 9. As luck would have it, my surfing lesson was to be at the Cloud 9 surf spot and I was beyond ecstatic to say the least! 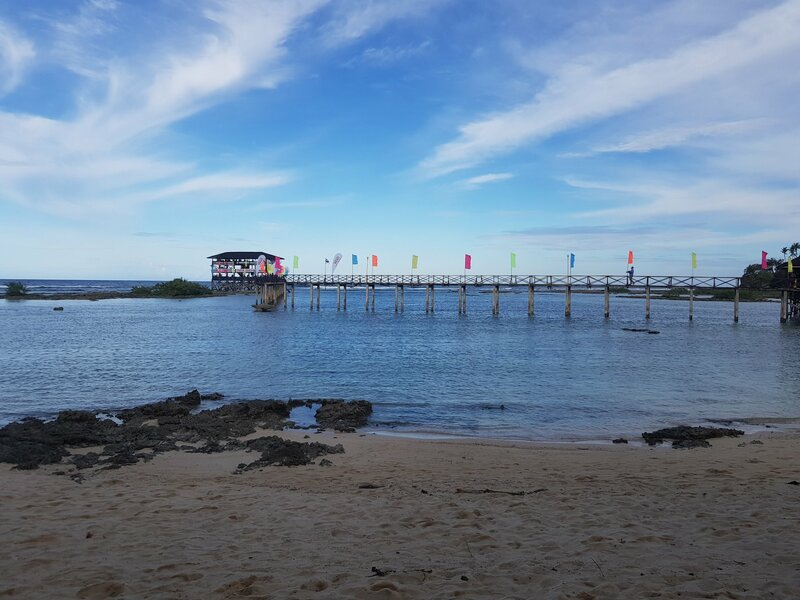 Surf lessons on Siargao vary in cost (especially if you can negotiate it down! ), and range from about 600 - 1000 PHP for a 2 hour session, with an instructor and board included. It can be even cheaper if your negotiation skills are absolutely on point! 600 PHP is approximately £9 or $11. Eleven dollars for having someone instruct you how to surf and be with you in the water, for two whole hours. AND A BOARD!? 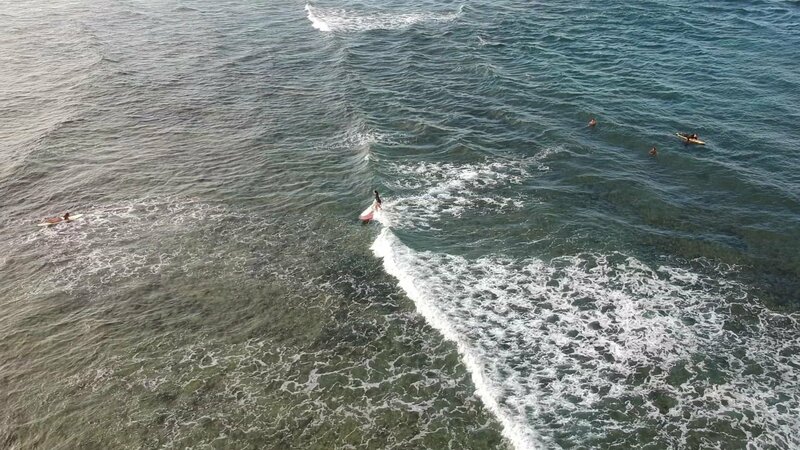 It's an absolute steal and sufficeth to say I surfed a lot while I was here in Siargao. But with my first surf lesson coming up, I was nervous but eager to be surfing at the famous Cloud 9 Pier. The next morning, I woke up just before the crack of dawn and met my instructor, Archie, who was waiting for me all ready with boards in the side holder of his motorbike. After a swift breakfast, we drove to Cloud 9 to begin the lesson! I was still drowsy, but the excitement was enough to surpass it, particularly because I had my drone with me - ready to take some captures of the pier at sunrise. After a ten minute drive, we finally arrived at the beach just before the pier, and gasped at the beauty of the place. Brilliant white sand with palm trees lining its edge. And stretching into the distance, the unmistakable and beautiful wooden structure jutting out of the ocean - Cloud 9 Pier. The wind was calm and through the eyes of the drone, the sea glistened and gleamed under the sun that was slowly rising. The waves were breaking about a hundred metres away from the actual pier, breaking into a brilliant white swash. There were already surfers there, so I filmed some of them in action - and soon enough I was ready to do my first lesson. After a quick tutorial on posture on the sand, we made our way towards the pier. The beach next to Cloud 9. Can't get enough of these white sands and palm trees! Extraordinary views and you can see why! Under the orange-blue streak across the sky, Archie and I walked down the pier with our boards under arm. I was feeling good. Apprehensive, but good. In my mind, I was recalling back to the few number of times I had surfed before and trying to remember my training - and before I could formulate my past experience, we were at some wooden steps about halfway down the pier and Archie gestured to me to head down first to the water. I clambered down and the water was like a lukewarm bath, despite how early it was in the morning! I had initially thought that I might need a rashvest to keep warm but that thought vanished when I realised how comfortable the temperature of the sea was here. Together, we walked the hundred metres to the edge of the coral reef where the water got deeper and the waves were breaking. Archie told me of his experience, and found out that he was born on the island and was surfing since he was just a small child. 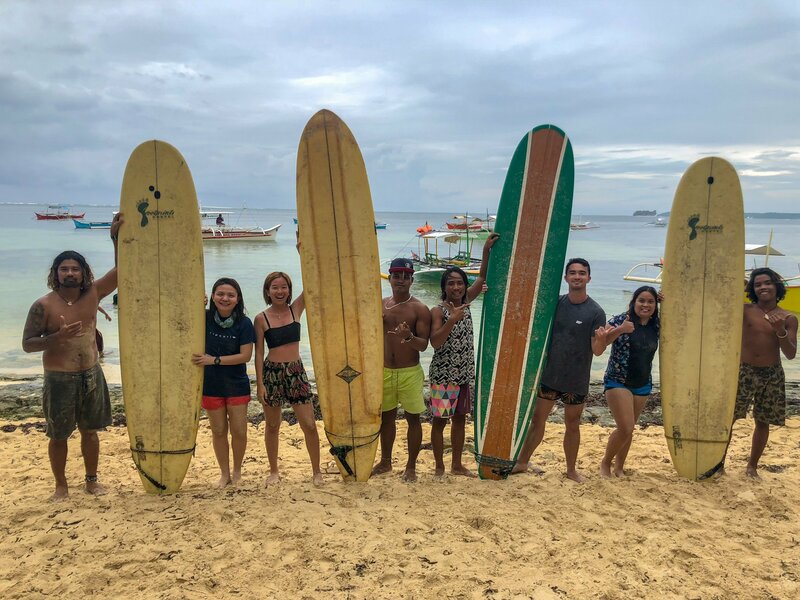 He explained that since the new influx of tourism that began about five or so years ago, he was able to adopt a stable job as a surf instructor and was thankful for the tourists coming to the island to learn to surf. But he expressed concern for the future of the island - more than anything he wanted people to experience the beauty of this place. However with tourism comes money and with money comes big business trying to muscle in with their fast food chains and tacky marts, and before you know it commercialisation takes place and the beauty is lost - like another Boracay, for example. And just as he explained himself, we arrived at the waves and he asked whether I was ready to surf. Of course! Nearby I saw other surfers already cutting the waves expertly, and some beginners having their lessons like myself. Fortunately I took up windsurfing at university, so balance luckily was easily found as I caught my first wave. With a gentle nudge from Archie, I found myself standing up for a second and then crashing into the warm sea. Like an excitable dog, I recovered, jumped on my board and paddled back to Archie. We repeated the process, implementing advice that he gave me and I could slowly feel myself improving after each wave. Paddle paddle paddle, push up, left foot forward, right foot back, bend the knees and turn your body forward whilst keeping your feet sideways to the front of the board. Easy in practice, but difficult to execute in a spit second where it counts once you catch the wave. But after a few more tries, I was finally getting it and was able to ride the wave until the end! It was exhilerating, tiring but completely and utterly addictive. I can really see why people take this up as a lifestyle! I was hooked. Over the next few weeks I'll be trekking through The Philippines and I'll be sharing with you my stories, emotions, advice and tips about this wonderful place. I will be doing this while sharing my photographs with all of you too. 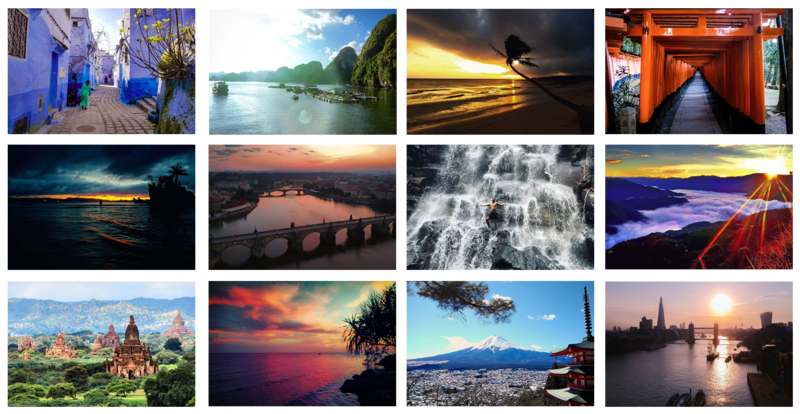 I sincerely hope this inspires you to go out there and travel! Any upvotes or reblogs are hugely appreciated! Much love, everybody. I could not believe I could not believe that the Philippine country is so beautiful. It's really astonishing and nice place to see it. The beautiful scenes of the sea waves are really beautiful. so amazing place, good luck! Your UA account score is currently 3.387 which ranks you at #7116 across all Steem accounts. Your rank has dropped 3 places in the last three days (old rank 7113). In our last Algorithmic Curation Round, consisting of 270 contributions, your post is ranked at #203. Wow, beautiful pictures. You've reawakened a drive to go visit, I may just have to in the new year. Thank you for sharing. Glad to have spurred you on to go visit. You won't regret it! If you need any advice at all, please do reach out. Incredible photos. Wow! This is definitely on my to-do list. Thank you for sharing. Glad you enjoyed the content bud! You got a 3.43% upvote from @booster courtesy of @seetheworld.sgp! 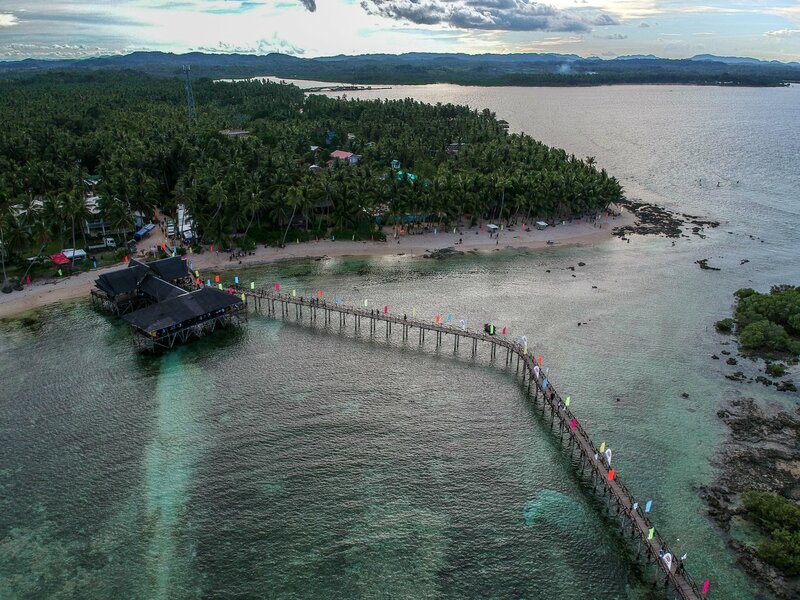 You should visit the islands in dinagat province. Just a few hours from surigao mainland. Start with Hibusong island, you will surely enjoy the place because there are many islands to check from. 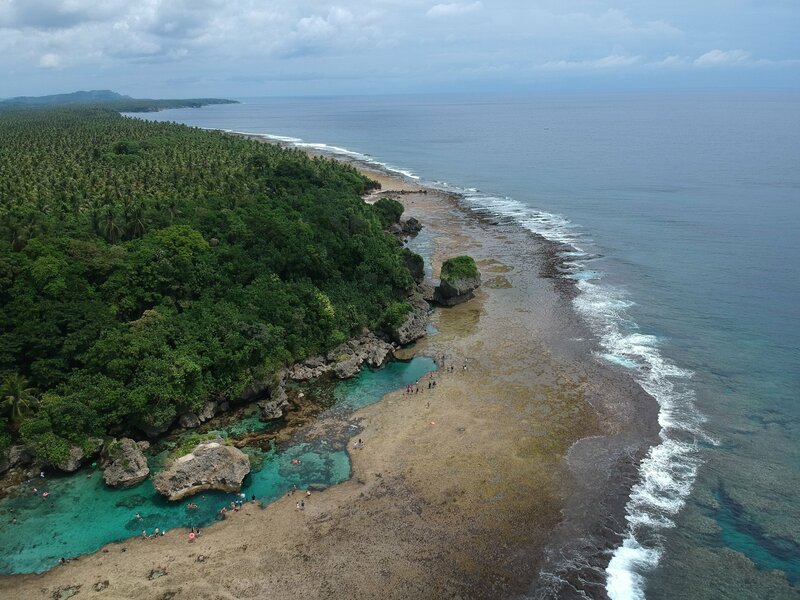 More or less 1 hr from siargao, you can take a boat to surigao and from surigao, boat again to dinagat province, an island province. That province is composed of many islands which definitely make your day exciting. PS : you have quite a following on instagram, check out share2steem dapp autopost to steemit. Thanks so much! :) The last one I sold to an organisation as they wanted it for use on their poster. But yeah its surreal! And thanks I shall definitely check that out! Neat pictures. I've always wanted to go surfing. Looks like a lot of fun. Its very rewarding and oh so addictive! Give it a try if you can. Nature is beautiful and natural when we preserve it, and most enjoyable. Thanks for sharing . Absolutely. We need to take steps to ensure we don't spoil what we see now for our children and their children. Is Spanish spoken in the Philippines too? Or only Filipino? Your images are looking really great, I feel like I'll never achieve this level of quality. :( Congratulations! Awesome post of an awesome country. I'm really glad that more and more post in this platform features my beloved country. :) Cheers! No problem, it deserves more recognition! It's my favourite country and there's good reason for it! 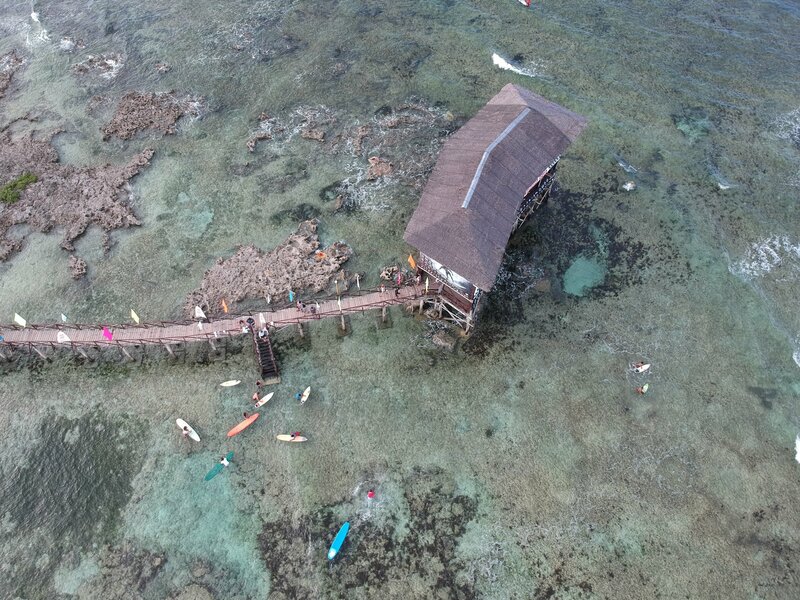 Wow awesome drone shot mate!!! Thanks muchly bro! Trying to fly it further every time. Woah, love the color of the ocen when the sun is shining up it. Yeah its ridiculous how blue the water is. Unlike anything tbh! Wow! that's some amazing stuff!!! !it indeed is LIKE a heaven! i am packing my bags some time soon have to learn swimming though! Loved it absolutely !keep it the same way or even better ! A very well written experience about The Philippines! I have put it my travel plan after reading your article. What a wonderful piece of work! This post has received a 62.50% upvote from @kennybrown! Really Philippines have unbelievable beauty very good environment for visiting. thanks for sharing this beautiful country. This post has received a 5.00% upvote from @daeshawn! You deserve an upvote for your post. Keep posting and I'll be around. One upvote deserves another please feel free to upvote this comment if you like what I do. Felicitaciones! Son fotos fantásticas! Mar...olas..surf ! lo tenias todo-- En esos momentos uno quiere que el tiempo no transcurra, cierto? . . voy a ponerlo en mi agenda de lugares a visitar Urgente! -Saludos..